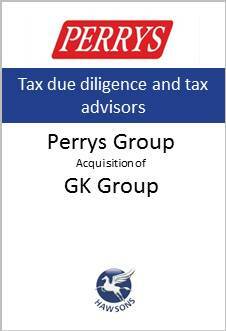 The Hawsons specialist tax and tax due diligence teams have worked closely with Northampton-based Perrys on this very important acquisition for the firm. Leading car dealership, Perrys, represents 16 of the UK’s leading motor brands and is the largest independent Peugeot dealer in the country. The Northampton-based firm, which has dealerships across the UK, is a highly successful, privately-owned business. GK Group, a Chesterfield-based car dealership with a £175m turnover, with five Ford showrooms, one Kia showroom and an accident repair centre was acquired by Perrys Group.